Mich-Matist, Winter 2003 (March), Vol 39-1, #143. Pp. 19-27. The latest version of the 10 litu banknote issued on November 21, 2001 by the Bank of Lithuania is of special interest to collectors in America. It features an early insignia patch of the Chicago, Illinois-area Palwaukee Municipal Airport located in Wheeling, Illinois, 10 miles north of O’Hare Airport. The patch is distinctly engraved as part of the cap of pilot Steponas Darius (1896-1933) who is shown on the face of the note along with his partner, Stasys Girenas(1893-1933). 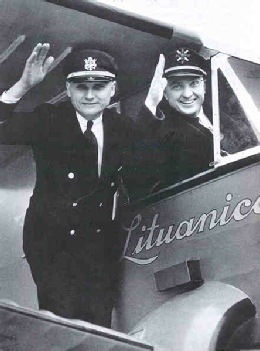 The duo attempted to beat Lindberg’s non-stop distance record across the Atlantic by attempting to fly from New York City to Kaunas, Lithuania, then the temporary capital of Lithuania. Darius was born at Rubiske, Lithuania in 1896 as Steponas Darasius. His father died while he was young; his mother remarried and the family moved to America in 1907. The family eventually settled in Bridgeport, a Lithuanian neighborhood in Chicago, Illinois. While growing up, Steponas became quite the sportsman and played a variety of sports, including rugby, football, basketball, baseball, and boxing. In addition, he worked as an errand boy at an aviation store owned by famous aviation pioneer Wright brothers. It was no wonder he quite naturally became interested in aviation, and began building his own models. During World War I he shortened his surname to Darius, and joined the U.S. Army in 1917. He served valiantly in France and was awarded the “Purple Heart” and the “Great War for Civilization” medals. After returning to Chicago briefly after the War, Darius returned to his homeland Lithuania in 1920, which was fighting for its independence. He joined the Kaunas Military School and was promoted to the rank of lieutenant upon his graduation in 1921. He joined the training squadron of the Lithuaian Air Force in 1922, and participated in the 1923 liberation of Lithuania’s port city of Klaipeda. He served in the Lithuanian Air Force for 5 years, and was promoted to the ranks of flying officer, and flight lieutenant. The aviator was concurrently intensively involved in many Lithuanian sports organizations and established himself there as a leader in the athletic world. Having received a year’s leave from the Lithuanian army (and later transferred to the Reserves) Darius left Lithuania in 1927 and returned to the United States to visit his friends and relatives there. On his journey home he witnessed the triumphant celebration for aviator Charles Lindbergh at Le Bourget Airport in Paris. Darius was inspired and determined that he would someday fly a plane from New York to Kaunas. Upon his return to the United States, Darius earned various pilot’s licenses, including international and transport pilot. He began racing airplanes and also established an aviation company with an American pilot in South Bend, Indiana. After some mechanical misfortunes, Darius left the firm in 1929 and returned to the Chicago area. He then began working for a Bellanca dealer at Palwaukee Airport north of Chicago. While there he became a pilot and instructor of Commercial aviation, and a master at flying all types of aircraft of his day. Palwaukee Municipal Airport was first called Gauthier’s Flying Field when it opened in 1925, consisting of 40 acres of grassy field with dirt runways. 58 acres were added in the 1930s, and 18 more in the 1940. The name Palwaukee is formed from a combination of the name of the village of Palatine, Illinois located 12 miles away, and Milwaukee, Wisconsin. The airport is located at the intersection of Palatine and Milwaukee Roads. Hence, Pal-Waukee. The airport was purchased by Priester Aviation Service in 1953. It went from private to public ownership on December 26, 1986 when it was purchased by the city of Prospect Heights and the Village of Wheeling. Today, Palwaukee Municipal Airport consists of over 412 acres and services numerous corporate jets. It is the third busiest airport in the state of Illinois, and relieves general aviation traffic from O’Hare International Airport, 12 miles to the south. More information about the history of this busy airport can be found on the Palwaukee Municipal Airport web site (www.palwaukee.com). Darius and Girenas greet you! Steponas Darius teamed up with aviator Stasys Girenas in 1932, and the pair formed a flying partnership dedicated to a well-publicized trans-Atlantic flight. Girenas also had a similar background as his partner, having been born in Lithuania, educated in Chicago, and serving in the U.S. Army in World War I. The duo purchased a used Bellanca Pacemaker plane from the Chicago Daily News (which had purchased a newer model) in 1932, dubbed it the “Lituanica” and modified it for their flight. Money was raised from numerous Lithuanian clubs and organizations to finance their operation. In their publicity photographs, Darius was always seen wearing his Pal-Waukee Airport patch on his cap. The duo left Floyd Bennett Airport in New York City headed for Kaunas on July 15, 1933, and crashed over Soldin, Germany (115 km. north of Berlin) on July 17 after 35 hours in flight. It was strongly suspected that they were shot down by the Nazi’s after they strayed well into German airspace. A thorough investigation however, pointed to stormy, rainy weather and fog as the most likely deadly factor in their flight. Autopsies revealed no signs of any bullets on their bodies whatsoever. The bodies of the pilots and their plane were taken to Kaunas, and over 60,000 persons attended the funeral there. The duo have since been memorialized on numerous Lithuanian stamps, coins, medals, and decorations. Numerous monuments have been erected in their memory both in the United States and in Lithuania. When Lithuania regained its independence in 1990, plans were made for the reestablishment of the national monetary system, the litas. A design competition was held for the various denominations. The 10 litù banknote was designed in 1991 by 28-year-old artist Giedrius Jonaitis (born 1963), a graduate of the Vilnius Art Academy, and a member of the Lithuanian Artists Association. 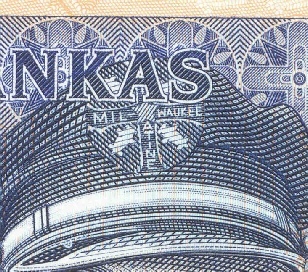 The note’s design features the theme of Darius and Girìnas, Lithuania’s famed aviators. The images of the flyers were based upon official 1933 press photographs of the duo. The back of the note features their plane flying over the waves of the Atlantic, with an outline of North America and Europe in the background. No boundaries of countries were drawn on the map portion, to avoid any controversies that existed as the result of the occupation of the capital city of Vilnius by Poland from 1920 to 1939, and subsequent Soviet-imposed boundaries following World War II. 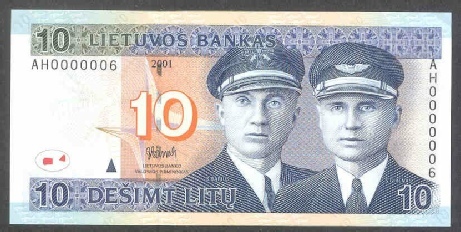 The original 10 litu note (KM-47) featuring the flyers was released into circulation on June 25, 1993 when the Lithuanian litas was re-introduced as the official monetary of the Republic of Lithuania. Dated 1991, the note was printed by the United States Banknote Corporation at its Los Angeles, California facility. It lacked a variety of security features, and no lettering appeared on the patch on Darius’ cap. The minute details of the flyers’ garb and markings on their plane changed with each subsequent printing of the 10 litù note as security features were added. The second version of the note was printed by Thomas De La Rue printers in England, and is dated 1993 (KM-56). It was released into circulation on March 1, 1994. It features a redesigned format that places the flyers on the right portion of the note. Several security features were also added. Some lettering was added on Darius’ patch such as “A” and “T,” but they were purposely indistinguishable and mis-aligned. The latest version of the note was printed by Orell Füssli Security Printing, Ltd., of Switzerland and features enlarged portraits of the duo on the face. The ties to the United States are strong on this particular 10 litu banknote, and will surely attract the attention of topical collectors both in America and in Lithuania alike. The details of the patch on Darius’ cap are clearly visible in this latest version. In the center is a star which separates the text. The horizontal line reads “MIL-(star)WAUKEE.” The top vertical text is covered over by the last letter “A” in “LIETUVOS BANKAS,” although a small portion of the letter “L” can be seen in what would read “PAL-.” The bottom vertical portion reads “ATINE,” or if it had been shown wholly, “PAL-(star)ATINE.” In each section between the lines appears the bottom of a plane, somewhat short and blunted, for a total of four. The 10 litu note featuring Darius and Girenas is one of Lithuania’s most widely-circulated and used banknotes today. The Lithuanian litas officially became tied to the Euro on February 2, 2002 at a rate of 3.4528 litai equaling 1 Euro. The litas had formerly been pegged to the U.S. dollar at a rate of 4 litai to 1 dollar, giving the litas a value of U.S. 25¢. Standard Catalog of World Paper Money, Krause Publications. Encyclopedia Lituanica, South Boston, Mass. ABOUT THE AUTHOR: Frank Passic is a life member of Michigan State Numismatic Society, and has served in various capacities over the years, including as a member of the board of governors, exhibit chairman, and chief judge. Passic serves as Numismatic Curator at the Balzekas Museum of Lithuanian Culture in Chicago. He is editor of The Knight, the official publication of the Lithuanian Numismatic Association (P.O. Box 22696, Baltimore, MD 21203. E-mail: Lithnumis@hotmail.com). He is also an active member of the American Numismatic Association and the Central States Numismatic Society. He lives in Albion, Michigan and may be contacted at: albionfp@hotmail.com.